Zach Bogosian, one of many OHL prospects scouted by Chris Edwards, should hear his name called early in the 2008 NHL Entry Draft. Well, I started with the NHL in 1990, working with the Hockey Operations department, and I’ve been with the League ever since. When I look back now, it’s interesting because I’ve done pretty much everything there is to do in the League. My main job when I started out was working with the officials doing video work, breaking down games for penalty calls for the officials – that was long before we started with the war room – but I would also shoot video for the top prospects, building out scouting videos for the teams. I really enjoyed that, working with the prospects, because I worked as a linesman in the OHL from 1988 until about 1993. So I saw a lot of really solid players come through the system. In fact, I worked games with quite a few guys still reffing today. I worked games with Stephen Walkom, Don Van Massenhoven, and Dean Warren, among others. As a linesman, you get to see a different side of the game than you do pretty much anywhere else, especially when it comes to breaking up the scrums. One memory I’ll never forget occurred while I was breaking up a fight. I was working games when Eric Lindros was playing in Oshawa, he was as physically dominant a player as I’ve ever seen. 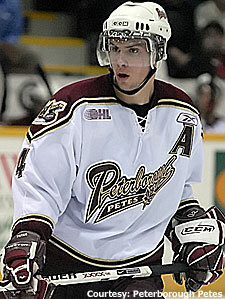 One game, in Oshawa, I looked over, and sure enough, he and ex-NHLer Drake Berehowsky were in a fight. Well, when it was all over, and we got in there, it was like pulling two gorillas apart. It wasn’t so much pulling them apart on our end, we were basically waiting for them to decide they were finished. That was one of the best games I ever did. Not only was the fight memorable, but it was two good teams, two fast, big, hard-checking teams. Chris Edwards is entering his eighth year with Central Scouting. He focuses on the Ontario Hockey League, but scouts heavily the other “domestic” Ontario leagues: the Ottawa-area Central Jr. A League and Eastern teams in the Onatrio Provincial Jr. A League. From beginnings in hockey as a linesman in the OHL, Edwards has carved out a career in hockey spanning 17 years. After his time calling the lines, Edwards served in numerous capacities with the National Hockey League, from breaking down video for use with League officials and top prospects to working in the League's 'Video War Room,' to his current position evaluating draft-eligible players for NHL Central Scouting. He currently resides in Roslin, Ontario. So like I said, from there, I jumped into Hockey Ops, so I’ve been fortunate enough to see all sorts of facets of the game – the business side, officiating, hockey ops. Now, as a scout, I’m doing work I really like – watching great hockey and great players; watching the future of the NHL every single night. I cover pretty much everything in North America. We really don’t have a lot of titles in our thing; we just cover as much as we can get to. With the travel, the hours, and the grind, it can be a very difficult job – especially since there is no exact science for what we’re doing. At the end of the year, we put out our list, and we believe it to be top-to-bottom accurate; but so much comes into scouting these players that the smallest little details have to be accounted for. For me, the most difficult thing is comparing a guy playing, say, provincial Junior A or high school hockey and a guy playing in the Canadian Hockey League. Say you can take in a high school game around Boston or in Minnesota, but then you take a step back and you say to yourself “This guy is playing with guys who are ninth and 10th graders, so what is the competition really like? How good would he be if he were skating in a more challenging league?” But, the more games I watch, the more players I see, the more I believe that good players are good players. If they really stand out, if they play that “pro-style game,” then you can tell they would be good no matter where it was they were skating. Those are the guys you look for, the ones who just know the game. Now, as I said, I watch games all over North America, but I see a lot of games in the Ontario Hockey League, and the players coming out of that league this year will be as solid a group as I’ve seen in years. One of the guys I see is Zach Bogosian, who I think is going to be the best pro prospect out of this draft. We have Drew Doughty rated ahead right now, and he’s going to be a heck of a player as well, but you’re projecting a guy with Bogosian’s size, who handles the puck like he does, who physically is as strong as he is, and he sure looks to be the real deal. Plus, Zach is getting better every game. From where he was last season to where he is now is staggering, and he looks to be getting better every game. Another guy – and much has been made of the defenseman prospects in the OHL this season but this guy will be one heck of a forward for the team that takes him – is Cody Hodgson in Brampton. He is another guy you knew he was going to be good; but when you see how he’s developed into a guy with puck skills and playmaking ability, to say I’m surprised might be a stretch, but he’s certainly upped his game by tremendous amounts. This season, he makes you think he’s going to be a No. 1 guy at the next level. Everything about him is getting better. And that’s another thing. The OHL is a grind. Every night you’re riding buses, at times through snowstorms or in the middle of the night, and everything that goes along with that. Sometimes, watching these players is as simple as recording how they react mentally to the mid-week game when they do ride through that snowstorm. You want to see their mental strength, their ability to overcome the little things, play their game, pack up, and head to the next arena ready to do the same job. And that’s what we’ll be doing, for the rest of the season into the playoffs, watching these kids. It’s an exciting time of the season right now, the best of the year, and every day I consider myself lucky to be doing this for a living. Thanks for reading. I’ll have another blog out soon, in a few weeks – see you then.